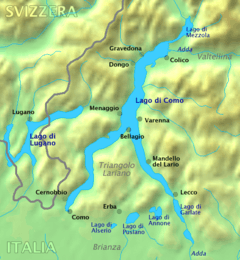 Towns along the river Adda include Bormio, Sondrio, Bellagio and Lecco (both on Lake Como), and Lodi. The Adda at Crespi d'Adda. 1 2 One or more of the preceding sentences incorporates text from a publication now in the public domain: Chisholm, Hugh, ed. (1911). "Adda". Encyclopædia Britannica. 1 (11th ed.). Cambridge University Press. p. 183.